Most of us learn about Paul Revere and his heroic 1775 ride to warn of the approaching British troops. Sadly, we don't learn about the 16-year-old girl who two years later rode her horse throughout the night, fending off highwaymen with a musket, to gather a volunteer militia in response to the burning of Dansbury. 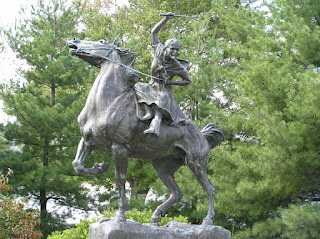 Sybil Ludington was the daughter of Colonel Henry Ludington and the oldest of 12 children. Her father headed a volunteer militia, which was on furlough that April night in 1777. When Col. Ludington received word of the attack, he needed to stay put and wait for his militia to arrive, but he had no one to gather the troops who knew where to find everyone. Some reports say the 16-year-old Ludington volunteered and some suggest her father asked her for her service. Regardless, she set out on her horse, Star, to ride forty miles, twice as far as Paul Revere, through the night. Along her way, some accounts say Ludington encountered ruffians with no allegiance to either side and fought them off with a musket. The militia went on to fight thanks to Ludington's long and fearless ride, but her story remained mostly unknown. After the war, she married a soldier, had a son, lost her husband to yellow fever, ran a tavern to support her son as he worked to become a physician and bought a home for her son and his family. Sadly, her son passed away, and Ludington struggled and died in poverty. Almost 200 years after her ride, history started to tell the story of that heroic night. In 1961, a local chapter of the Daughters of the American Revolution built a statue in her honor. She was featured on a US Postage stamp in 1975, and more recently, books have been published telling the story of the 16-year-old girl who fought bravely for freedom. Mental Floss wrote about Ludington in 2016. Play a board game that follows "Ludington's Ride." Read one of the many books written about her.